Picked in a copse at Ashton Court yesterday. All different shapes and sizes; the fresh kernels have a taste a bit like coconuts. Mmm! 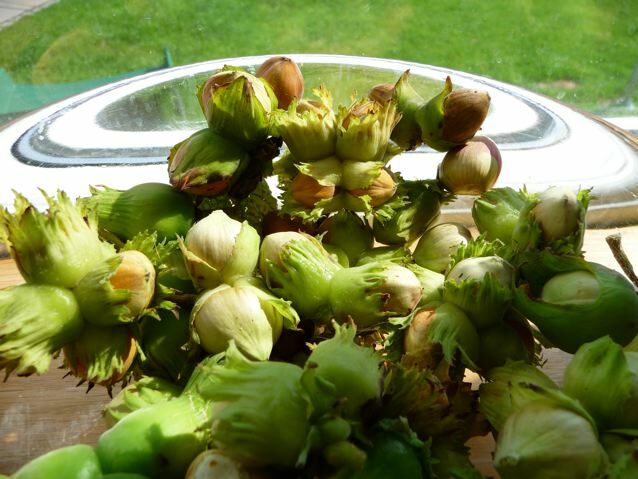 This entry was posted in Dog Walks, Wild Food and tagged wild hazelnuts on 06/09/2010 by Joanna. The hazel nuts look delicious have you had any cobnuts this year? Lovely! We have a hazel at the bottom of the garden but rarely get to pick the nuts have we have some very industrious squirrels who get there first. When we are sitting on the terrace sometimes we get bombed by gnawed open shells discarded from above! Hi Fran, no cobnuts yet, I saw some in the shops but they were very dear. Are you planning on making Dan Lepard’s cobnut loaf? it’s a lovely bread. @ Andrew – we have two squirrel repellers (Zeb and co) here – we picked the ones in our garden a couple of weeks earlier, from a purple hazel, the nuts sadly are just the same colour as usual. Last year the squirrels planted the nuts everywhere in the garden and we had masses of little trees growing in the spring, which we have lifted and given away. My father always called the wild hazelnuts, filberts. Filberts, cob nuts sometimes they are called here too, Heidi. I think ‘filbert’ refers to the longer oval ones, but there are so many species of hazelnut around, even the ones that I picked from different trees looked different. I love them all, guess your father too, but it’s rare to see them in a park. Park = squirrels = no nuts on the trees! Joanna thank you, you’ve answered my question. I’ve been wondering if it’s too early to pick hazelnuts. I’m so wanting to get to them before the squirrels, but wasn’t sure if they’d be ready yet. Thanks Jo, will have a look, but I do know commercial cobnuts ripen earlier than wild hazels. I will have to check out those chocolate cobnuts too.